There’s never been a better time to own a Pet Supplies Plus. 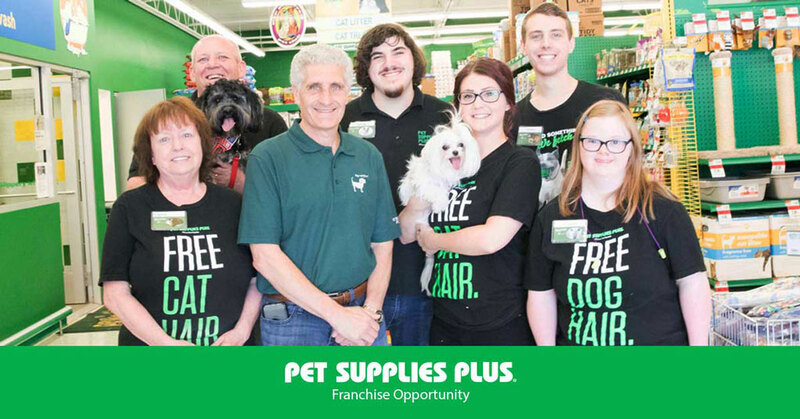 Just ask Jeff Bonanni, a multi-brand, multi-unit Franchise Owner for more than 30 years, and the first Franchise Owner of a Pet Supplies Plus. Bonanni, who opened his first Pet Supplies Plus location in 1989, owns four Pet Supplies Plus stores in Michigan, with plans to open a fifth location later this year. Bonanni has watched the burgeoning brand grow into an industry powerhouse as the premier pet specialty franchise, with a local, neighborhood feel. Along the way, strong franchisor support has made his stores even more organized and easier to run. “I’m so impressed with how we’ve developed,” says Bonanni. With more than 450 stores nationwide, Pet Supplies Plus is set to soar as the largest “independent” pet specialty operator, backed by strong leadership and the mega muscle of Sentinel Capital Partners, a New York-based private equity firm, specializing in franchising, who acquired Pet Supplies Plus in December 2018. Bonanni, who first heard of Pet Supplies Plus from a family friend, has always been a fan of the unique brand. “It’s basically a grocery store for pets. It was a very new concept at the time, and I was intrigued from the start,” remembers Bonanni. Since signing on with Pet Supplies Plus, Bonanni has built a franchise portfolio of multiple brands, centered on restaurant concepts. Still, his passion and love for Pet Supplies Plus has only grown, calling Pet Supplies Plus his favorite business of the bunch. And for good reason. Pet Supplies Plus is the premier pet specialty franchise in a pet market industry projected to top the $100 billion mark in 2021, according to the recently released 2019-2020 U.S. Pet Market Outlook report. With 100 stores in the development pipeline, the brand is on the road to strategic growth as the premier pet specialty franchise. Bonanni points to the ease of franchise operations, money to be made, and the originality of the concept as just a few of the reasons for Pet Supplies Plus’s success. He says the franchise focus on customer care through knowledgeable employees has allowed Pet Supplies Plus to remain relevant and flourish with the times. Whether the topic is nutrition or toys, customers embrace the in-person feedback, guidance, or advice for their precious pets. Pet Supplies Plus franchise owners are also making a difference in the lives of the pets and people in their communities beyond the four walls of their stores. One of Bonanni’s stores holds cat adoptions to help place ownerless animals in safe homes—with more than 110 cats placed in new homes last year alone, he says. Other store contributions include donations of food for families and animal shelters and adoption aid for seniors who can no longer care for their pets. Bonnani is most excited about their Pets for Vets Program, which helps place animals and donations with Veterans in need. After three decades as a franchise owner, what Bonanni loves best about Pet Supplies Plus is what the customers love as well. “It’s your neighborhood store with a great selection and a truly excellent customer service experience,” says Bonanni. To learn more about the Pet Supplies Plus franchise opportunity, visit petsuppliesplusfranchise.com.